Running a business is like living on a never-ending roller coaster. Outside of providing the services your business offers you also need to be the marketer, financial controller, human resources, trainer and a whole raft of other roles. In fact, you often must do everything that a large business or organisation must do, with the tiniest amount of resources to do it. To ensure your business thrives in this type of environment you need to get smart about how the more mundane tasks are completed. Thankfully there are many systems and tools available that allow you to manage your businesses operations with the power of modern technology. 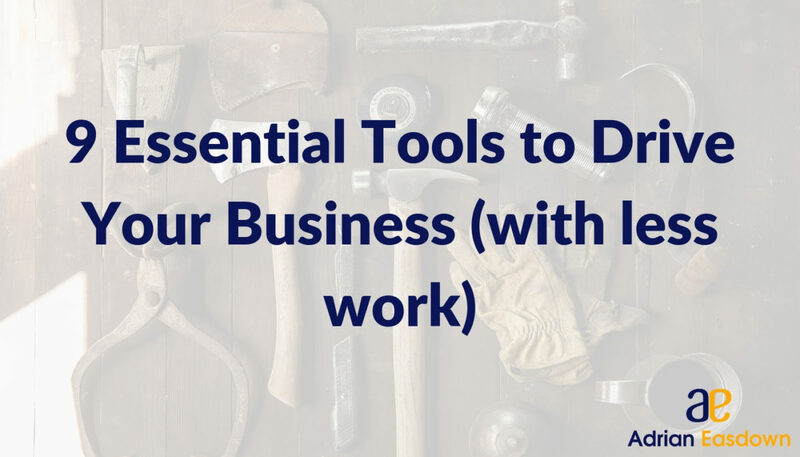 I’ve searched around and have found nine tools that can help make your business run as effectively as possible. Even if you have your business set up for card payments, these payments can be slow to arrive into your bank accounts, not to mention the hidden fees that some operators can charge you. Due has a speedy payment system and offers highly secure payment types, it also has a very low rate that it charges for transactions (2.8%). Due is the kind of payment system that is completely transparent to its members and does not charge additional monthly fees or charges. One of the problems with having a website is not really knowing where your site visitors go and how they interact with your web pages. Sure, you can link up your analytics account to your website that will show you the more popular pages and how your visitor got there, but MouseFlow goes one step further. The system creates a heat map that shows you where your site visitors’ cursor is moving on the page which can allow you the insight to see what catches readers eyes more than others and optimise your pages based on this data. You Need a Budget is one of the handiest tools available. It can really help your business thrive and help you measure your scalability. The system offers business owners help with the financial and legal elements of running their business. It offers many debt visualization and categorization techniques – valuable software that will prevent your business failing early on. This tool has helped many entrepreneurs accurately calculate the scalability and profitability of their products/offerings. This handy piece of software can help you keep track of all your marketing efforts on one platform. The system can monitor email marketing, website landing pages, and even your webinars (if that’s the path you’ve chosen to go down). It allows you to automate all the marketing programs you have created so that you can focus on your day to day running of your business, and to look for new ways to innovate offerings to your guests. This system is one I personally use all the time to communicate with my team across the multiple sites I manage. The system works just like a large chat room that opens the use of private messaging, online meetings, channel communication (such as one for HR and one for general communication). Slack is like email communications on steroids and has one of the best elements that email communications and phone calls do not – the ability for everyone to see the communications (so no one can claim the loss of an email again). You can share files, make phone calls, make video calls – it really is a fantastic communication tool. Keeping the line of communication with your guests is one of the highest priorities that business owners have – if you can’t communicate with guests you are in trouble. Unfortunately, there are so many avenues available – email, phone and website inquiries – it can be difficult to keep on top of them all. This is where Intercom comes in, the program allows you to aggregate all communication lines for your business and places them in a contact box on your computer screen so you can simultaneously monitor them all in one spot. I have adopted Trello so much in my life that we now use it to track our home budget and weekly grocery lists as well as our business priorities and programs. Trello works exactly like a whiteboard, except it is all online. You can assign different people various tasks, set due dates and give certain things priority over others. If you only adopt one time-saving system from this list go for Trello – it really is a huge time saver. Emails are often overlooked as a way of improving your bottom line, however, if you use this avenue with a little finesse then the ROI impact can be significant. Rapportive is a very handy piece of software that you can use with your Gmail account to track how your campaigns are working with your guest database. You can see open rate and a whole load of other features that other (more expensive) email marketing tools offer. When you are managing people from different locations, finding cost-effective ways to give everyone access to the documentation required for their roles can be challenging. So why not use one of the biggest storehouses for data on the planet and enlist the services of Google. Setting up your team on Google Drive is incredibly easy, it has inbuilt communication elements for its Docs and Sheets functions (think along the lines of Microsoft Word & Excel). Google Drive is one of the best and most secure file sharing services available – and the best part is that it’s free. In today’s world, running a business does not mean that you have to do large amounts of busywork. In fact, today’s technology allows you to run a small business with all the power of a large company – the trick if finding the right tools.